Let 2019 be the year you travel differently! Explore places you’ve never been before, gain new experiences, and discover new perspectives. Surprise yourself to get outside your comfort zone and conquer your fears. Dare to go on that grand adventure. Here are 12 travel goals to inspire your travel planning. How many can you tick off your bucket list this 2019? Download or take a screenshot of this travel goals checklist and use it to inspire your travel planning this 2019! Be sure to tag us on Instagram @skyscannersg so we can see what your goals are for this year. Always wanted to conquer your fear of heights? Dare yourself to take the leap and go bungee jumping this year! If this is something completely outside of your comfort zone, New Zealand’s Nevis Highwire platform at 134-meters might be a good place to start. For a scenic jump in the midst of nature, head to The Last Resort in Nepal and leap from the top of a 160-metre gorge with the Bhote Kosi River flowing below you. James Bond fans can reenact the famous scene from GoldenEye and dive off the Verzasca Dam in Switzerland from a whopping 220-metre platform. Tip: look for a reputable company to jump with to calm your nerves just that little bit more. Cappadocia is one of the most famous regions in the world for hot air balloon rides. It’s also one of the few places where you can ride throughout the whole year. Feast your eyes on Cappadocia’s striking ridges and valleys in summer with colourful hot air balloons dotting the horizon beyond. Winter promises a starkly different landscape with views of enchanting snow-capped mountains. If you fancy trying this out a little closer to home, why not head to Myanmar? Bagan is also well-known for their hot air balloon rides, and ballooning season usually runs between October and April. You can catch Bagan’s sunrise whilst drifting above ancient pagodas slowly rising from the morning mist. Popular European cities like London and Paris continue to draw in the crowds, but there is a whole other side of Europe waiting to be explored. Listen to stories about ancient Greece from the steps of the Parthenon in Athens. Find yourself in the very heart of King’s Landing and relive your favourite Game of Thrones scenes in Dubrovnik. This medieval Croatian city was used as a shooting location for the popular series, and you’ll find familiar spots as you stroll along the winding limestone streets of the historic Old Town. European holidays won’t necessarily burn a hole in your wallet, and searching for multi-city trips is one way to scoop up great value deals. There’s nothing quite as freeing as facing open winding roads that promise nothing but endless possibilities and discoveries. Cross-country road trips are a great way for you to let go, live a little, and embrace your inner adventurer this year. Just be sure to get a comfortable car for your journey as you’ll be spending lots of time in it! So, what are you waiting for? Grab a map and hit the road! US road trips: A traditional rite of passage for young Americans, the “Great American Road Trip” should certainly be on your bucket list. Admire breathtaking waterfalls and mountain landscapes on the Columbia River Scenic Highway, or cruise down Route 66 in a Mustang Convertible with the Grand Canyon laid out before you. Japan has always been one of our favourite destinations. From the buzzing city life of Tokyo to the foodie paradise of Osaka, we never seem to get tired of heading back year after year. This 2019, how about exploring Japan beyond the usual hotspots? Hiroshima: Venture west of Japan to the city of Hiroshima. Destroyed by the atomic bomb during World War II, Hiroshima has been on a long road to recovery and now stands as reminder of the perils of war. Visit the Atomic Bomb Dome and learn about Hiroshima’s war history at the very site the atomic bomb landed in 1945. You also won’t want to miss the sacred Itsukushima Shrine, a World Heritage Site with an impressive torii-gate towering over emerald green waters in the middle of the sea. What’s better than exploring a new destination? Exploring two destinations, or even three! Shake up your usual travel routine and plan a multi-city bucket list that will pack more experiences into a single trip. Singapore – Phuket – Bangkok – Mandalay – Singapore: Get fit and fierce at a Muay Thai Boxing Camp in Phuket, enjoy a city break in bustling Bangkok, then admire nature’s beauty with a hot air balloon ride over Bagan at dawn. Singapore – Male – Dubai – Singapore: Soak up the sun and make friends with sea turtles on one of Maldives’ paradise islands. Then, head over to Dubai to scale the world’s tallest tower, go skiing in a desert, or skydive over rolling sand dunes. Hiking up a mountain will take a bit of preparation, but it’s a great travel goal to work towards. It may sound like an impossible task reserved only for the fittest of the fittest, but with consistent, moderate training, you’ll be well-adept to take this on. Why not get your friends or loved ones on board too and make it a group travel goal? Nepal: Home to the tallest mountains in the world, Nepal is a fantastic place to tick this particular travel goal off your bucket list. Get up close and personal with the Himalayas’ most magnificent peaks, and gain a new sense of achievement and confidence when you crush this goal. With a variety of beginner hikes and more challenging routes like Everest Base Camp, beginners and experts alike will find a suitable hike to conquer. If you’ve never been to a festival, you’re missing out! Change that this year by checking out some of the world’s most unique festivals. Coachella, California (April): Coachella is one of the biggest music festivals in the world, welcoming hundreds of thousands of music lovers annually for a weekend of partying with the biggest acts in the music industry. If one of your new year’s resolutions is to get fit, why not work towards it by trying out a new activity? Get outdoors and trek through amazing trails surrounded by nature. Start with easy weekend treks in Macritchie Reservoir before levelling up with other trekking destinations! Peru: The Inca Trail is a challenging trail suitable for more experienced trekkers. Taking about 4-5 days to complete, the trail begins in Cusco and leads you to Machu Picchu, the mysterious ancient Incan city resting high up in the Andes. Active nature lovers can up their travel game with this next bucket list item. Many of us would have taken a kayak out to sea at some point, but who can say they’ve kayaked through a rainforest? This year, kayak through lush rainforest ecosystems with nothing but you and the river, and watch nature unfold before you. Kuching, Malaysia: Explore Borneo’s captivating wildlife and nature with The Rucksack Rainforest Kayaking team. Cruise down the Sarawak river in your kayak and be greeted by limestone rock formations, cascading waterfalls, monitor lizards, and even wild monkeys. Make stops along the river to visit local villages, or trek to scenic waterfalls and natural springs. River rapids along the way make the journey more fun! Amazon, Brazil: Experienced kayakers can up the ante with an adventure in the Amazon. Choose from 1 to 10 day tours exploring the rich Amazon ecosystem, home to the highest concentration of flora and fauna species in the world. Kayaking gives you unobstructed views to unique wonders like floating forests, pink Amazon river dolphins, and white-bellied spider monkeys. Embark on a great adventure and travel in the footsteps of Marco Polo through the world’s oldest and longest trade route — the Silk Road. This ancient route starts in the historical capital of Chang An (now known as Xi An) and extends as far as India, Pakistan, and Rome! Choose from horseback riding, trekking, rafting, mountaineering, or jeep tours to take in the sights. There are many different starting points and routes to choose from (depending on what you want to experience), so start planning! Why not make it a multi-city trip to travel the Silk Road, climb the Great Wall, and see the life-size Terracotta warriors all in one trip without breaking the bank? We’ve all lusted over Instagram snaps of dream accommodations around the world, but how about actually staying in one this year? Find out what it feels like to be royalty and book a stay in a castle. Ashford Castle, Ireland: The former home of the Guinness family, Ashford Castle offers a 5-star luxury experience in an 800-year old castle. You can kick back and unwind in their state-of-the-art spa, or take leisurely walks on the rolling 350-acre estate. If you’re looking for something a little more active, try your hand at different classic pastimes like archery, horseback riding, clay shooting, fishing and falconry. Take note of all the public holidays you have for the year and mark them out on your calendar. This will help you plan for short getaways or longer travels accordingly. You can even hack public holidays to end up with more vacation days! Then, plan and book your trips in advance to get the most savings. Open the Skyscanner mobile app. Add in your origin, destination, and dates you wish to travel. You will see a bell icon in the bottom corner of your screen. Tap this icon and create your price alert. Once you’ve activated Price Alerts, you’ll receive notifications if the price rises or drops to book at the right time. You can turn off these notifications and remove your price alert at any time. Ready to start ticking off those travel goals? 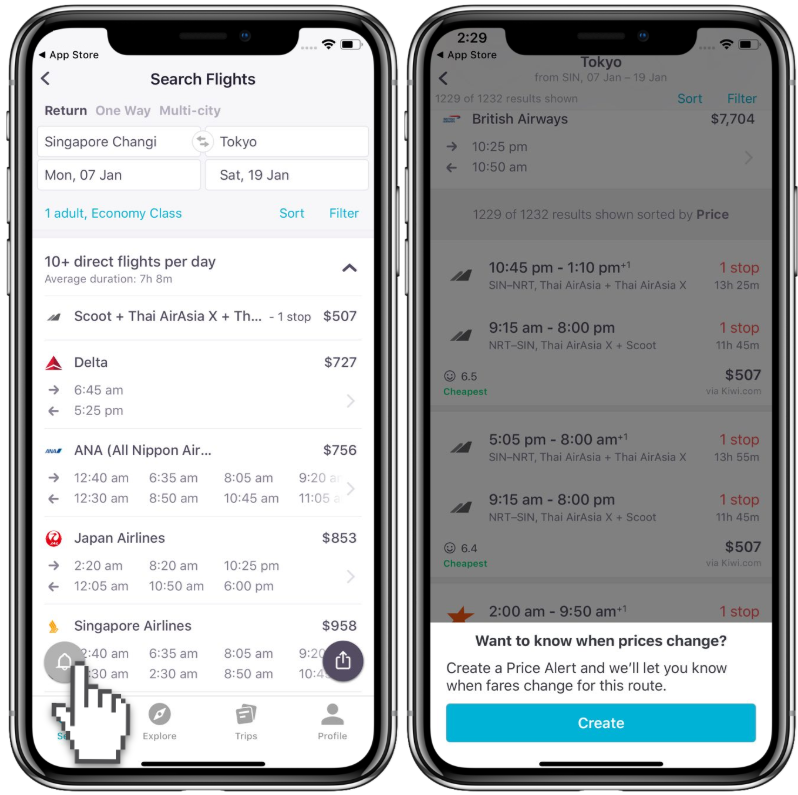 Book cheap flights, hotels and car rental via Skyscanner today, or download our free mobile app for easy browsing and booking on the go. Published in January 2019. Any prices are lowest estimated prices only at the time of publication and are subject to change and/or availability.